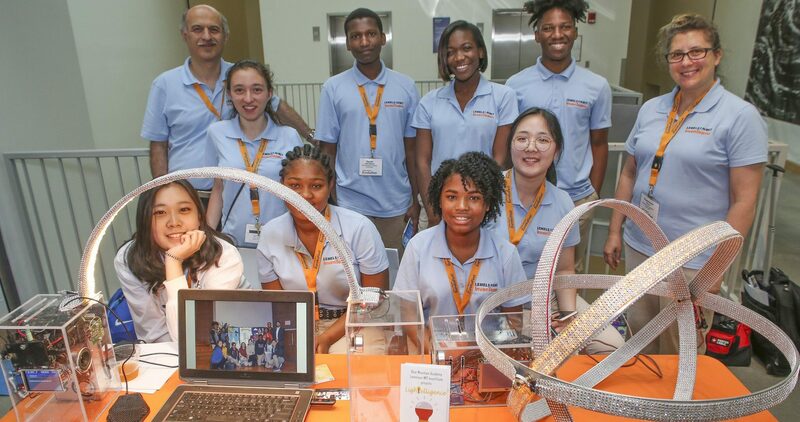 Beaver Works taught a four week residential STEM program held on the MIT campus for approximately 200 talented High School rising seniors from across the United States. Beaver Works Summer Institute (BWSI) offered 8 courses in this transformational, rigorous, world-class STEM program. These courses included Autonomous Racecar, Autonomous Air Vehicle, Cognitive Assistant, Medlytics, Cubesat, UAS-SAR, Embedded Security and Hack a 3D Printer. Check out the BWSI YouTube channel to see the amazing things they did all summer long. The students and their accomplishments were also featured in a news story by WCVB, and by their admiring colleagues at MIT (read J-WEL’s coverage). For more information on what will be offered for next summer’s program please contact Beaver Works at bwsi-admin@mit.edu. In July, BioBuilder’s two-week Synthetic Biology workshop introduced hands-on laboratory tools and an engineering approach to biology for students from Wuhan University. The project-based workshop was held at LabCentral and was enhanced with visits to the Broad Institute, where students toured the genome sequencing facility, to MIT’s SynBioCenter, where students learned about the use of liquid handling robots. The Wuhan students also heard special presentations from current MIT students. This year’s MIT iGEM team taught a unit on responsible research analysis, and Divya Ramamoorthy, a graduate student in Prof. Ernest Fraenkel’s lab in the Department of Biological Engineering, gave a lecture on her research that uses computational tools to analyze Parkinson’s disease. The visiting BioBuilder students also heard about engineering and entrepreneurship as they interacted with biotech startup companies like Asimov, a synthetic biology company launched by Prof. Chris Voigt of MIT’s Department of Biological Engineering. Participant reactions were ecstatic–one of the Wuhan students wrote that the workshop reaffirmed their resolve to apply for a biostatistics degree, a decision they’d been struggling with for some time. The Edgerton Center worked with the US China Scitech Education Promotion Association to provide STEM exploration workshops for over 100 12-18-year old students from Beijing, China. The sessions ranged from understanding and building basic electronic circuits, to exploring the structure of DNA and proteins, to taking strobe photos in the vein of Harold “Doc” Edgerton’s high-speed imaging. Approximately fifty K-12 educators took part in the Edgerton Center’s Summer K-12 Maker Workshop Series, learning introductory and advanced technical skills integral to designing and operating successful maker spaces. Rising seventh-grade girls from Lynn Public Schools in GE Girls at MIT spent a week at the Edgerton Center soldering electrical connections, designing sailboats, constructing LEGO cars and tracking infectious zombie plagues. They also spent a day at a nearby GE Aviation facility. Rising ninth-grade girls from the local area spent a week at the Edgerton Center in the You GO Girl! program on hands-on science and engineering activities mixed with high school preparatory sessions. Students built motorized LEGO® cars, experimented with strobe-light photography, “bred” LEGO fish cells to understand the relationships between genes and traits, and more. On August 1st through the 3rd, the Lemelson-MIT Program hosted an invention education summer workshop at MIT for educators interested in learning how to implement the JV InvenTeams curriculum in their classroom, summer camp, or after school program. EurekaFest was held June 20-22 on the MIT campus and celebrated 15 teams of high school student inventors and six collegiate inventors who won the 2018 Lemelson-MIT Student Prize competition. Keynote speaker and 2013 Lemelson-MIT Prize winner Professor Angela Belcher captivated the audience with her inspiring speech that encouraged high school inventors to not quit, even if people think your inventive ideas are crazy. TSL hosted 14 educators in August to kick off our INSPIRE program (Innovating New Spaces for Practice and Research in Education). The goal for the collaboration includes modifying and integrating practice spaces into their courses, co-designing research, helping colleagues implement these ideas, and designing new practice spaces. On July 11, TSL welcomed over 30 teachers, student teachers and education professionals to a Dine and Play event. Dine and Play occurs every other month and is a great opportunity for local educators to test new games and interactive tools that TSL has developed for teachers. Members of the Beyond Rubrics team in TSL traveled to Corte Madera Middle School in Portola Valley, CA to co-design a set of embedded assessment tools. The team of teachers included an English / Language Arts teacher, a Science & Math teacher, the Makerspace Coordinator and district administrators who will be implementing hands-on making projects in their classrooms this fall.